Wood. I used to live not far from here in Lakeview, but boy, I never eat in Lakeview. 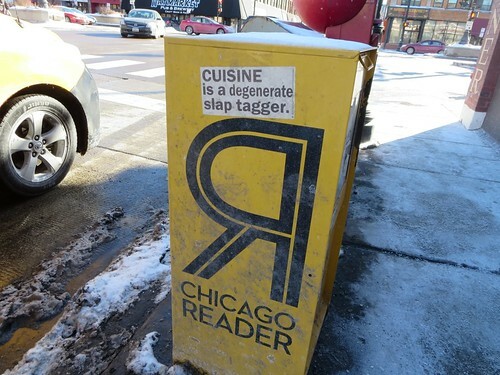 It’s a mystery how a neighborhood full of disposable income, one assumes, just never seems to have anywhere in it that you need to eat at, when ratty old Logan Square is coughing up new must-try places like fur balls. But Senza finally made one destination stop in Lakeview, and a lot of people have told me Wood, despite the tee-hee Boystown humor of the name, was another. Not quite, I think. I think it’s a very solid neighborhood place, which is what Lakeview needs more of first before it worries about rivalling Randolph Street. From the name I expected a driftwood and foraged branches interior, which it has a little of but a lot more disco and smoked glass mirror. Foodwise, I would call it classic, a little behind the times (not a bad thing when the times it’s taking you back to were good times) but extremely well executed. A half chicken— one piece fried, one confited— reminded me of the great chicken at the short-lived Kith & Kin. 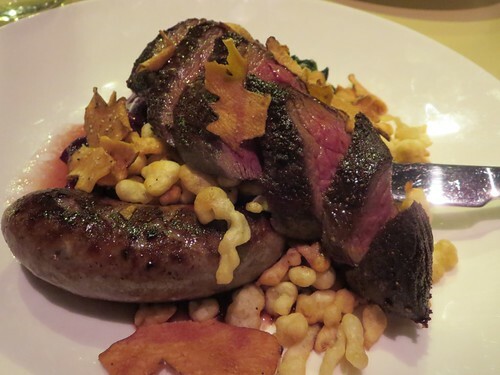 A venison dish— again done two ways, a sausage and some loin, with crispy spaetzle— could not have been better cooked, the sausage cooked to a supple done-ness that many here still overcooking sausage could learn from. Small plates, I should say, were plenty big; a beet salad would easily work as a starter for two. Nothing blew my mind, nothing changed how I viewed cuisine, but for upscale comfort food, an admirable place. Every neighborhood should have one. Gather. I also expected more rusticness here— from descriptions, including the communal dining, I envisioned something kind of weathered barn-y, like Farmhouse or Grass Fed Beef in Bucktown— so I was surprised by the sophisticated look of this Lincoln Square spot. Which extended to the food; I was still puzzling why Wood felt like 2004 to me, but I started to understand a little better what I meant when I saw the plates here with their brilliant beet purees, their dribs and drabs and crunchy little nubbins on top. But it’s not just a matter of visual presentation; I felt they were aiming more ambitiously for cutting-edge flavor combinations (and hit the slightly preposterous menu notes of our time more often, with ramp aioli and pork belly with caramelized milk and such things). Does every neighborhood need that? I don’t know, but Lincoln Square went from not having it to having it pretty quickly with Goosefoot, Elizabeth and (much more modestly priced) Gather, so it seems the question is settled. (And settled in another way by the closing of La Bocca della Verita, the kind of Italian place that used to be the epitome of neighborhood dining in this town.) 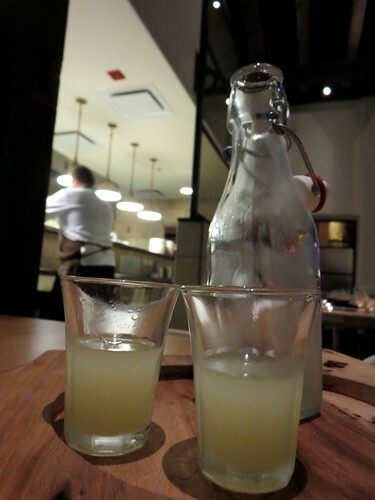 Overall, I found Gather lived up to its promise of sophistication pretty well. A charcuterie and cheese platter was well put together for contrasts; dishes like the pork belly and sturgeon with salmon caviar and blinis as an accompaniment were thoughtful and interesting and certainly pretty well executed, if not quite as sharply as at Wood. My only advice would be that the communal seating up front is better than the tiny boxed-in seating area in the second room, which makes getting up to go to the bathroom a communal project. 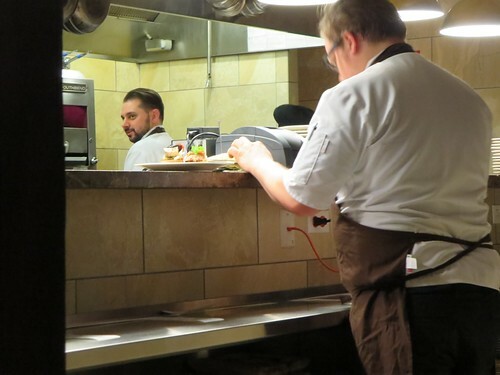 Phil Rubino and Mike Sheerin in the kitchen at Cicchetti. Cicchetti. When I heard that Mike Sheerin was going to an Italian place, it didn’t sound that promising— someone with his training, and his cutting-edge inclinations at Trenchermen with its eccentrically avant-garde comfort food, seemed unlikely to be happy cranking out standard Italian dishes. And it wasn’t promising that Cicchetti was named for a style of bar food from Venice, but the food wasn’t really like what those places actually seem to have (or so my friend Kenny Z tweeted, and based on what I saw, I believed him). But then he explained how it was made— Painted Hills flank steak was glued with meat glue, then allowed to age like salumi for a few weeks. 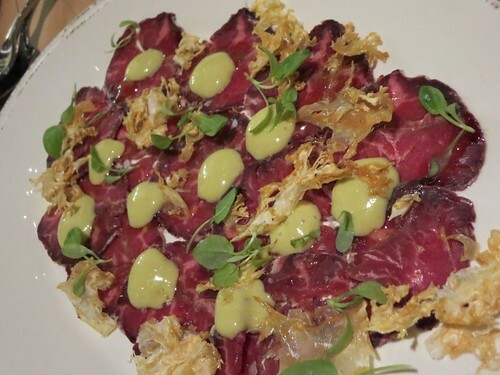 So a little of his WD-50 heritage there, crossed with Trenchermen cured meats. 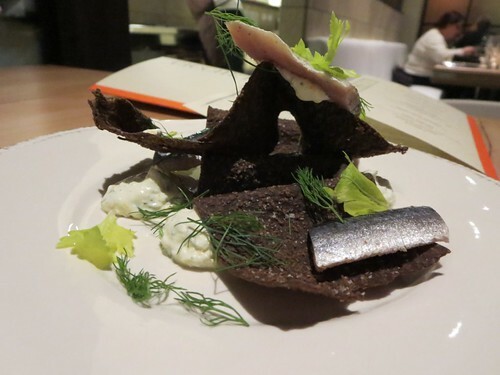 And the dish, on closer inspection, is as artfully plated as a dish at Acadia, but in a way that doesn’t call attention to itself as strongly; while the dabbed aioli (or whatever it was) again seemed more French or Nordic than Italian. This is the kind of steak dish I thought Next Steakhouse might offer as a buildup to the big meat course, an imaginative play on steak that uses its familiar accompaniments, takes the meat in a different direction, and offers the pure sensory satisfaction of beef without knocking you out for the evening. Instead, it’s here, and it’s terrific. So Cicchetti, best new Italian restaurant in town? Not exactly (and that’s even if Nico hadn’t just opened). It’s more a personal restaurant, a reflection of its star chef and his high end skills, than you would have ever guessed from the name, the concept, and Sheerin’s hired-gun role— yet somehow it’s also as comforting and unthreatening as “Italian restaurant” promises. (The same is true of the design, which manages to mix rustic and big-city-sophisticate notes successfully.) You could take your Nonna here, where Trenchermen would have had her scratching her head, and still feel like you’d been somewhere adventurous enough for you. That’s a great combination that deserves to triumph over its nondescript location in an anonybuilding in the Northwestern medical complex. The Dawson. Design was also a redeeming factor for this Billy Lawless project, which looks from the outside like a massive River North bro bar, except further west. (The infamous chicken fried steak that wasn’t fried had jaundiced me against it too.) I went there for the Between Bites reading with David Hammond, Nick Kindlesperger and others, and afterwards a couple of us grabbed a bite downstairs. The downstairs bar was sleeker and chicer than I expected, with a kind of 19th century industrial gaslight look; I was immediately impressed that there was more going on here than I’d expected. The drinks were excellent, but the food only fair. The menu has something for everyone, pork belly tacos and crab cakes and pickled onion rings, but if anything stands out, we never really found it. Chestnut ravioli, big as a bathroom tile? Not bad, not delectably memorable. Crab cake? Plenty of meat, but had a canned tuna taste that didn’t deliver on the richness of crab. A burger topped with bacon and tangy white cheddar, too greasy, somehow not quite making those basic elements into a satisfyingly indulgent whole. Overall, I’d say my opinion of the place went up from seeing it, it’s not a hack bro bar as I feared, but the food needs time to find its focus and sharpen the dishes to adding up to at least the sum of their parts. The Brixton. Two letters away from The Bristol, and located in the Andersonville space that was Brasserie 54 that was Premise that was In Fine Spirits, and after all that, two seconds after walking in the door I felt like they’d finally found the restaurant that made sense in the space again, the neighborhood gastropub that Premise didn’t want to be. 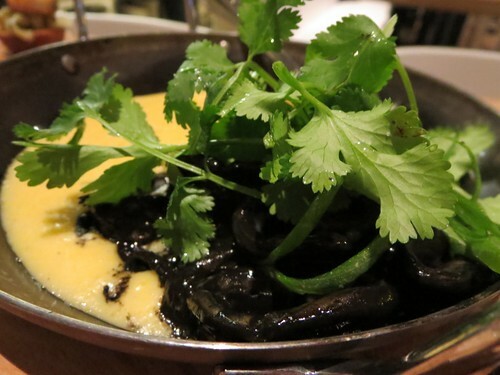 Kevin McMullen, who was at EL Ideas for a while, is the chef, and the things I tried mostly hit the right note for the space of seeming approachable but dressed up a little (as in the squid ink Jackson Pollock splatter all over the plate of a very tart lemony octopus dish). I liked the octopus and a silky chicken liver mousse a lot; I was a little disappointed that brussels sprouts with pancetta sat in a puddle from having been steamed, roasted would have been better. Andersonville isn’t as low on first-rate neighborhoody places as Lakeview, but it’s not overrun with them yet either, and The Brixton is a creditable, approachable addition to the list.